Our team is growing and we are now accepting applications for individuals who would like to join our Beyond Violence Facilitator team. *Currently seeking qualified applicants who are willing to travel to Belfair, WA (Mission Creek Corrections Center for Women) , Gig Harbor, WA (Washington Corrections Center for Women) and the surrounding Puget Sound area. Beyond Violence is an evidence-based manualized curriculum for women in criminal justice settings (jails, prisons, and community corrections) with histories of aggression and/or violence. It deals with the violence and trauma they have experienced, as well as the violence they may have perpetrated. This four-level model of violence prevention considers the complex interplay between individual, relationship, community, and societal factors. It addresses the factors that put people at risk for experiencing and/or perpetrating violence. The Beyond Violence Program is a 40-hour program, broken into 20 sessions. Each session is 2 hours long and will be held twice a week for 10 weeks. Bright New Day is seeking facilitators for its Beyond Violence curriculum. This is a wonderful opportunity to participate in a groundbreaking program that we hope to build into a sustainable opportunity for women who are being released from Washington State prisons. The Beyond Violence Program comes with a facilitator guide that will need to be adapted for our specific uses. Facilitators must be willing and able to go through material, prior to the start of the pilot. At certain checkpoints throughout the program, Bright New Day will ask facilitators to facilitate surveys so that we can gather information on the programs effectiveness. The position(s) reports to Bright New Day’s Board of Directors. Keep Bright New Day’s Board of Directors abreast of issues that are surfacing within the groups and report weekly on program progress. Perform other duties as required in support of the program, including, but not limited to: period reporting, administrative requirements and grant inquiries. The program curriculum is 20 hours and can be divided into many formats (2 hours per week for 10 weeks, 1 hour per week for 20 weeks, etc). We are open to formatting the program depending on the facilitator and the location. A small stipend will be paid for facilitated time, as well as travel per diems. To apply, please send a resume and statement of interest to hillary@brightnewday.org. Applications will be accepted on an ongoing basis. Bright New Day is seeking two (2) co-facilitators for our pilot of the Beyond Violence curriculum. We are open to proposals from pairs of already established facilitators, as well as individuals. Because this is a pilot, the duties may vary and candidates must be comfortable with changing priorities. This is a wonderful opportunity to participate in a groundbreaking program that we hope to build into a sustainable opportunity for women who are being released from Washington State prisons. Applications will be accepted through April 8, 2016 (extended deadline). It is been a while since we last updated our community on what we have been doing at Bright New Day. The holidays came and went, and 2016 has flown by – already propelling us into March. While we may not have been posting updates, our board has been hard at work continuing the development of our pilot Beyond Violence program. As with all good things, there has been lots of discussion, hundreds of emails and even a phone call with the program’s creator, Dr. Stephanie Covington. We are committed to the individual and social change necessary to support women, who are or have been incarcerated, to live healthy and fulfilling lives. We do this by connecting women to the resources they need to develop the life skills and social supports for futures as productive members of society. So please stay with us, as we continue to develop this pilot; we know it will be worth the wait. P.S. I would be remiss to not thank and recognize our small, but mighty, group of directors. Dennis, Dave, Elizabeth, Natalie, NoElle and Theresa, thank you for continuing to further this mission. It is a true honor to work with you. And to those community members and donors, that have continued to support our development, many, many thanks. Looking for another way to support our programs? The Beyond Violence Workbook is a vital part of our program. 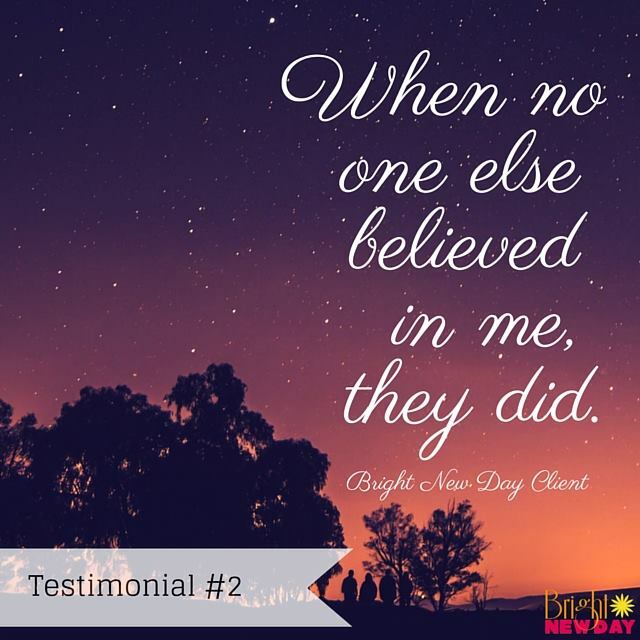 Each woman receives her own workbook that will walk her through this personal journey. Support Bright New Day with your gift of $45 and know that you’re connecting women to the resources they need to develop the life skills and social supports for futures as productive members of society. 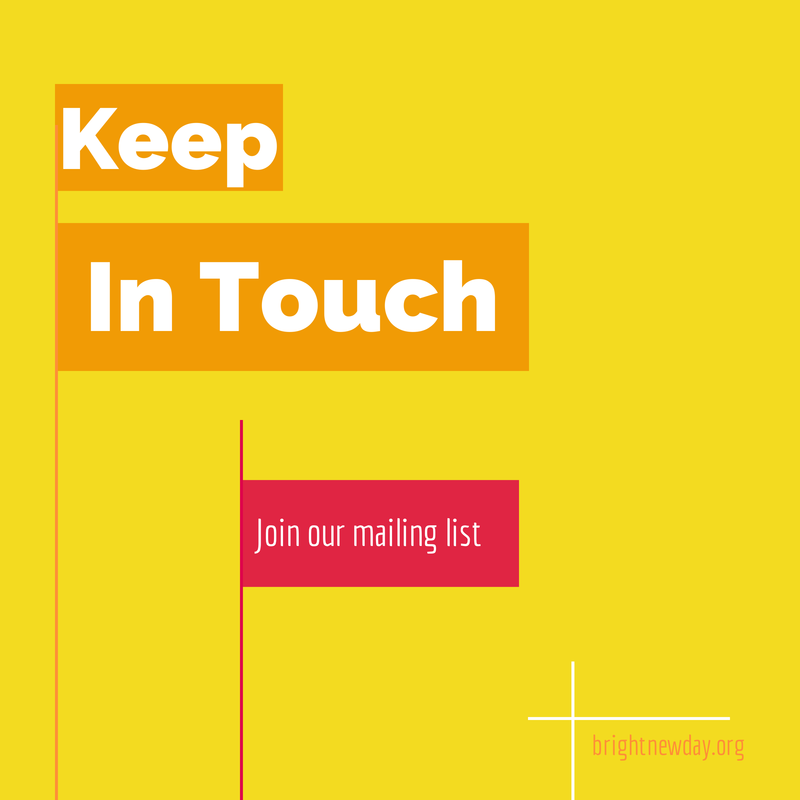 Check out our latest message to our supporters. 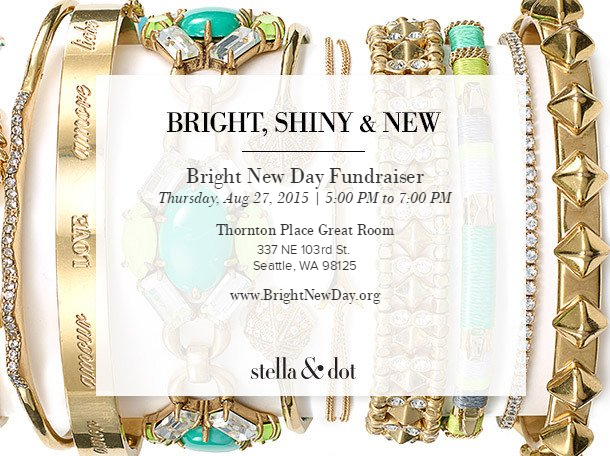 Bright New Day has partnered with a stylist from Stella & Dot to bring you this exciting online event! Bright New Day’s Holiday Extravaganza is a great opportunity to shop online for all your holiday treats now through December 18. A portion of your Stella & Dot purchase will benefit Bright New Day’s Beyond Violence curriculum for domestic violence survivors who are formerly incarcerated! Join our Facebook event and be entered to win free gifts and access to exclusive Black Friday and Cyber Monday deals! In addition to Stella & Dot goodies, we’ll also have some special items for auction, opportunities to directly support our programs and much more! Looking for other ways to support our programs? Shop through AmazonSmile! Amazon will donate 0.5% of the price of your eligible AmazonSmile purchases to Bright New Day whenever you shop on AmazonSmile. Set Bright New Day as your charity today! Check out other ways you can donate to our cause here. Bright New Day is excited to announce our Fall Program – Beyond Violence. This evidence-based domestic violence intervention curriculum, developed by Dr. Stephanie Covington, is for domestic violence survivors recently released from prison. This is an extremely important program, as the majority of women in prison are survivors of domestic violence and/or sexual assault, but there are very few domestic violence programs specifically for women with criminal histories that help women address their trauma and explore how that trauma relates to their criminal history. You can learn more about the program here. Bright New Day is proud to bring this evidence-based program to Washington State and is looking forward to adding more sessions in 2016. If you are interested in learning more about our Fall program, please contact us here. We are also raising funds so that we can offer this program at no-cost to the participants. You can support us, by making a purchase through our Stella & Dot trunk show or you can make a direct donation here. Since our inception, we have been committed to providing services to women who are or have been incarcerated. In June of 2014, we carried on as a volunteer-led organization and now, here we are in 2015, back and stronger than ever. Our board has continued to meet monthly and last night, we met to discuss some very exciting things that we have in store for 2015. There are many new things on the horizon for Bright New Day and we will be keeping all of you updated as we progress.